“We’ve tried to talk to [the Korean e-Sports Association] for three years, but we can’t get them to recognize our IP rights." “Of course we think our IP rights should be respected. 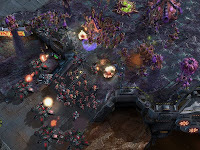 StarCraft II will be released soon, so we will have to look for a new partner”. It's a big thing over in South Korea, if it's down your alley, get more info here.